Who's going to object to more of these? 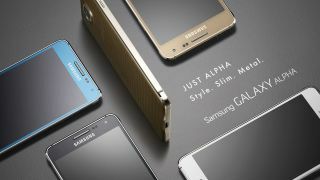 The recently revealed Samsung Galaxy Alpha has already made quite a splash, but the company likely won't stop there. The stylish metal Alpha is only the beginning of an entire A-series of similar smartphones, according to SamMobile. The site learned from its "insiders" that Samsung will reveal three other A-series phones in coming weeks: the SM-A300, with a 960 x 540 display, and the SM-A500 and SM-A700, with full HD screens. And lo and behold, a listing for the SM-A500 appears to already be hidden on Samsung's mobile website, though not in any easily digestible format (try a control+F; it's there). The Samsung Galaxy A-series will reportedly all feature designs similar to the Alpha, with metal in their chassis. They'll also have superior front-facing cameras, possibly like the Samsung Galaxy Note 4's rumored upgraded 3.7-megapixel front snapper. Since the Note 4 is expected to arrive during IFA 2014, Samsung may debut the three new A-series phones at a later date, so as not to dilute the phablet's spotlight. In the meantime peep TechRadar's analysis of the best Galaxy Alpha deals around.